Happy Thanksgiving everyone. Thank you all for buying my paintings this year and keeping me in paint. I used some of that paint in the last several weeks in a painting trip to Napa Valley, CA. Autumn in the vineyards is an explosion of color. 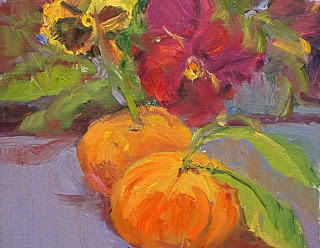 Not only are the trees all dressed up in fall finery; but the miles of grape vineyards are all decked out in rows of reds, golds, yellows and bright greens. 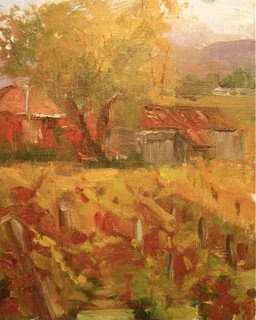 Napa Fall is a little 8 x 10 study . This one can come to your home, unframed for $185. 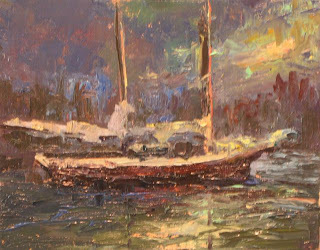 See my web site for more paintings from this trip; which included included San Francisco and Mare island. ajanefulton.com. Call artist at 949-395-2139 for further information. 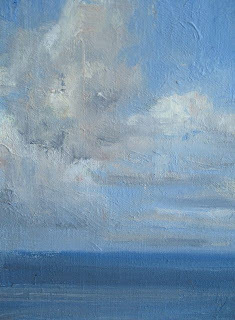 This little 8 x 10 study is from Camden Harbor, Maine. Hopefully it will morph into a larger painting sometime soon. Stay Tuned. It is available, unframed for $185 plus postage. Contact artist for further information 949-395-2139. 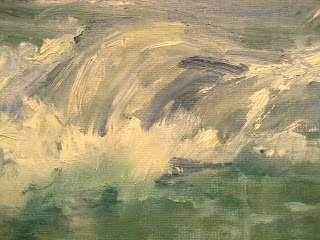 This painting was created the same day as Sweet Little Wave. The afternoon light at this beach (Heisler Park,Laguna Beach) is often a quick and fleeting gift. 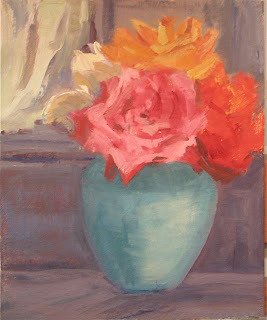 The painting was a very quick study as Lefty was tired by now and would only yield the palette knife. All praise should be directed to Lefty, whom we have come to find is somewhat insecure in her new found skills. This study is available for $185, plus shipping. Contact artist at 949-395-2139 for further information. at 11:09 AM Labels: Heisler park. 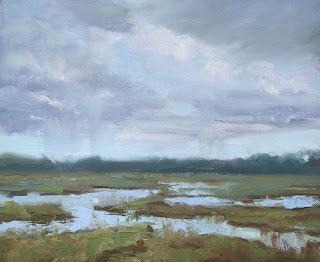 I am pleased to report that my painting "Storm Over Savannah" was awarded an Honorable Mention ribbon at the LPAPA Best of Plein Air show last night. The show will remain up until June 16th at the Laguna College of Art and Design in Laguna Beach California. Contact the school regarding purchase at (949)376-6000. More of this show can be seen on their website at www.lagunacollege.edu. 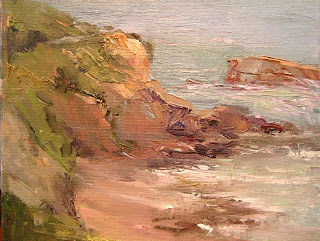 This little study was one of several completed on this great beach day. The rain clouds have traveled east and left their spring cousins to decorate the still cool ocean skies. The days are crisp; but brilliant ; with just enough moisture left over from the storms to set up some neat atmosphere. 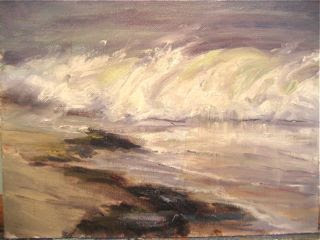 This study is available for $185 unframed. Call artists for further information at 949-395-2139. It's been a wild couple of days here at the beach. As the hot front moves off to the east and the low moves in from the north...the ocean hearlds the return of the sea winds with major waves and crashing surf. 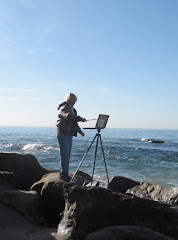 When I hear the surf pounding the beach at night I know I will be up early to grab my painting gear and head for the beach at first light. 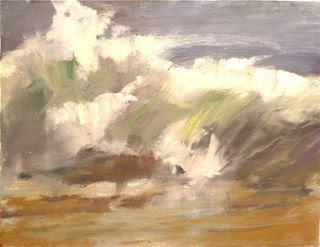 Here is "Surf's Up" an 8 x 10 that emerged from these efforts. Available for $185 unframed. Contact artist at 949-395-2139 for further information.